There are just so many good graphic novels out there that it's almost impossible for them to make enough of a splash. I don't remember ever seeing this 2014 album-sized book being solicited by Image, but did see it on a sale table a while back and figured, because of writer Derek McCulloch's Gone to Amerikay OGN, I'd give this a chance. It's really pretty good, so I'm glad I did. Displaced Persons is a multi-generational family drama set in San Francisco. It tells the story of the Price/Abramowicz family, focusing on three eras, with a few forays into other times and places. The first third of the book is more or less a straight-forward private eye story, as Garland Price is hired to look for a missing heiress, and discovers some weird goings on in the 1930s. After that, we move into the late 1960s, as Garland's two grandsons, one a cop and the other a little shady, find themselves in conflict with one another. Later still, in the 1990s, we check in on one of Garland's great grandchildren as she deals with an abusive relationship. There are some constants to this story - the family has remained in the same house throughout the century, and there is a recurring theme of people disappearing. 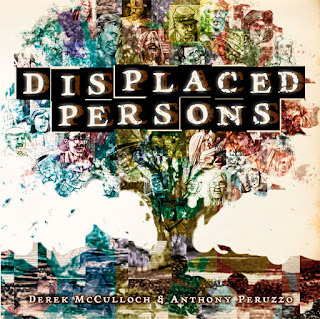 Much of this book is about examining the way the people left behind cope with those losses. McCulloch very lightly uses a magical realist touch in this story that helps link the various strands together, and provide it with its odder moments. The plot fits together nicely by the end, explaining the slightly confusing opening, and the characters stand out as being distinct. The art, by Anthony Peruzzo, is fine, but not terribly memorable. I like the way the book is coloured monochromatically, with each era being given a different tint. Beyond that, Peruzzo's work is a little unfinished looking, but still manages to tell the story well. This book worked very well overall, and I'm saddened that I didn't hear more about it when it was first published.